Asparagus is a vegetable native to Eurasia, where it grew wild. Michigan is a top producer of asparagus, and plants there have a life span of 12 to 15 years. Asparagus grows best in Michigan when one-year-old crowns are planted in a well-draining soil that has full sunlight conditions. The plants do not tolerate wet soil and require a two to three year growing period before they are strong enough to produce spears for harvest. Work 2 to 3 inches of organic compost into the planting area with a tiller to increase the nutrient content and water-draining properties. Dig a trench that is 6 inches deep and 12 to 18 inches wide. Make a 1 to 2 inch mound in the trench for each asparagus plant. Set the plant in the trench so the roots are spread out over the mound and the crown bud placed upright on the center of each mound. Space the plants 9 to 12 inches apart in the trench with the rows 4 feet apart. Cover the asparagus crown with 2 inches of soil at the time of planting. Do not fill the entire trench with soil. Add soil to the trench as the plant grows during the summer. The crowns will rise during the first year of growth and need to be gradually covered with soil. 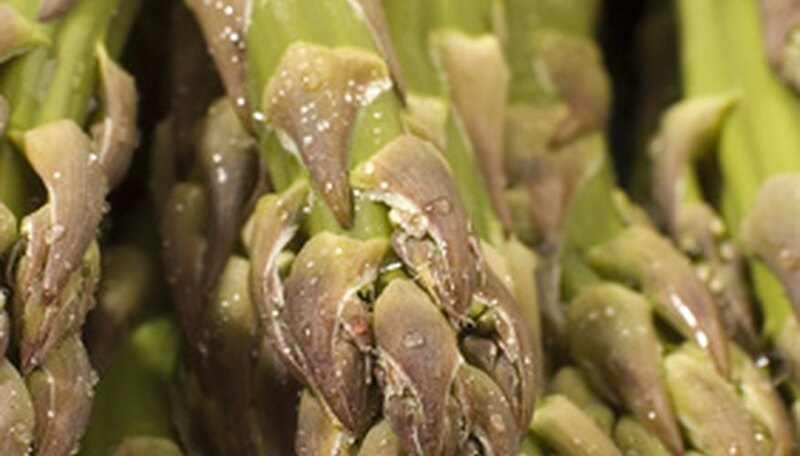 Grow the asparagus plants for two years before harvesting the spears. The plants need to focus their energy to produce large root systems during this time. Harvest spears the third year of growth by cutting in the months of May and June. Water the asparagus after planting to moisten the soil. Asparagus plants do not require irrigation in Michigan, as the plants are deep rooted and receive enough water from the soil. Fertilize the asparagus plants each spring after the first year of growth by working a balanced 10-10-10 garden fertilizer into the soil. Apply a 3 to 4 inch layer of grass clipping or seedless straw mulch around the plants to control weeds. Pull weeds as they appear to prevent insect problems in the asparagus plants. Excessive weed growth will hinder the plants as they compete for water and soil nutrients. Do not harvest asparagus after July 1, as the plant needs to mature and gather energy. Remove the plant tops after the first frost in the fall season.